2-AXES Gimbal Rotary System comes with precision worm gear technology. 2-AXES Gimbal Rotary System features high performance rotary stages and 360 degrees of continuous travel. The System is suitable for scanning and tracking applications for small optics and antennae. 2-AXES Gimbal Rotary System is equipped with high torque NEMA 17/23 stepper motor and comes with optional rotary encoders, slip rings and metric tapped holes. Unit offer a max speed of 10 rpm with load capacity of 10 Kg and a repeatability of 30 arc-sec. 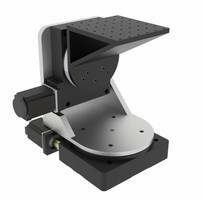 Integrated two-axes rotary gimbal system is designed for general purpose pointing, scanning and tracking applications for small optics, antennae and other sensors. System is equipped with high performance rotary stages and offer excellent stiffness and load capacity making them suitable for a wide variety of applications and motorized with high torque NEMA 17/23 stepper motors. Optionally, can be equipped with rotary encoders mounted to the back of the stepper motor to provide closed loop servo performance with IntelLiDrives ServoStep controllers. For applications that require 360 degrees of continuous travel, this gimbal is available with slip rings utilized on one or both axis. Available with metric tapped holes for installation of additional instruments or optional third rotary stage for ROLL capability. Tactical Airborne Gimbal System uses MWIR imaging system.